Newsletter Templates | Email Newsletter Templates | 100+ HTML Files | Download Now ! 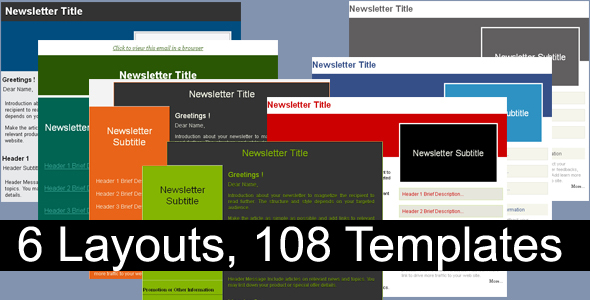 100+ HTML email newsletter templates tested in all the major email clients. The templates are coded using HTML tables and inline CSS to work with all email programs. You can edit these templates in any HTML editor to meet your needs. 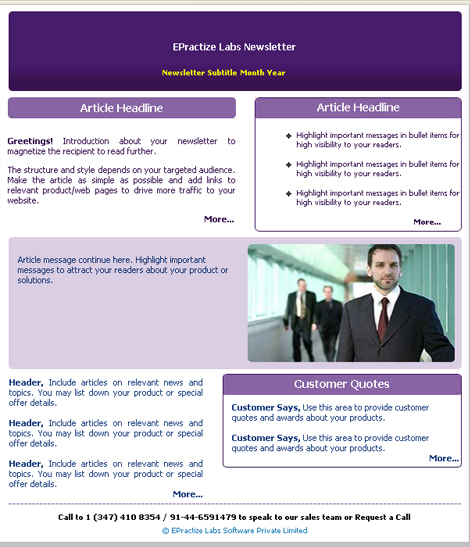 The contents displayed on each template guides you to made your email newsletter. The code is easily edited so you can customise the colours or the layout as much as you like and create even more options for yourself to use. We have paid special attention to typography and layout with these templates so that the email will almost always be viewed as intended with only slight variations in a few of the multiple email programs available. We have purposely left out images as a lot of the email programs turn these off by default and require the user to turn them on each time they receive an email. Meaning the intended recipient only sees the text and a lot of empty boxes with crosses in. Gmail (Explorer), Thunderbird 2.0, Thunderbird 3.0, Lotus Notes 8, BlackBerry Text, AOL Mail (Explorer), AOL Mail (Firefox), Apple Mail 4, BlackBerry HTML , Android 2.2, Gmail (Firefox), iPhone, iPad, Lotus Notes 8.5, Me.com (Firefox), Yahoo! Mail (Firefox), Hotmail (Explorer), Hotmail (Firefox) and Email Marketing Software Express.